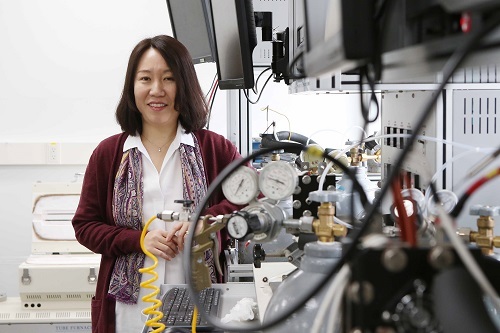 Professor EunAe Cho in the Department of Materials Science and Engineering reported a fuel cell catalyst that shows 12 times higher performance and twice the durability than previously used platinum catalyst. Fuel cells, eco-friendly power generators, are said to be running air purifiers. A hydrogen vehicle powered by fuel cells can allegedly purify more than 98 percent of the particulate matter and ultrafine particles from the amount of air that 70 adults breathe. Despite this peculiarity, the high price of platinum, which is used as an electrode catalyst, remains a big challenge to accelerating commercialization. In addition, recently developed ‘nano-structured platinum catalysts’ have not yet commercialized due to its meager oxygen reduction reaction and durability in fuel cell. Addressing all those challenges, Professor Cho’s team reported a platinum catalyst costing 30 percent less but boasting 12 times higher performance. The research team, to this end, combined the platinum with nickel, then applied various metallic elements for making the most efficient performance. Among others, they found that the addition of gallium can modulate the oxygen intermediate binding energy, leading to enhanced catalytic activity of the oxygen reduction reaction. They made octahedron nanoparticle platinum-nickel alloy and could efficiently achieve 12-times high performance with the platinum catalyst by adding gallium to the surface of octahedron. Existing fuel cell catalysts have issues in practical fuel cell applications. However, Professor Cho’s team experimentally proved the high performance of the catalyst even in the fuel cell, and is expected to be practically applied to the existing procedure. First author JeongHoon Lim said their work demonstrates the gallium-added octahedral nanoparticles can be utilized as a highly active and durable oxygen reduction reaction catalyst in practical fuel cell applications. It will make it feasible for the mass production of the catalysts. This research was described in Nano Letters in April and was supported by the Korea Institute of Energy Technology Evaluation and Planning (KETEP), the National Research Foundation (NRF), and the Agency for Defense Development (ADD). 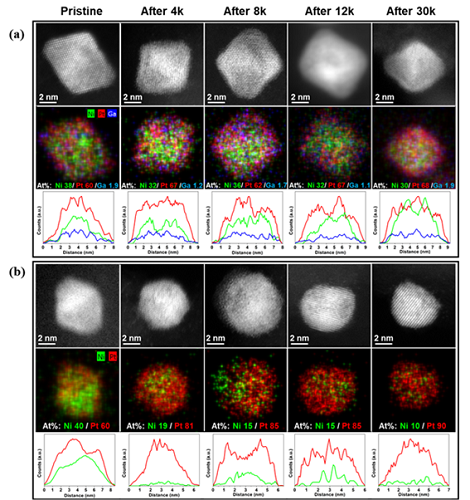 (Figure: HAADF STEM images with EDX analyses and line scanning profiles of (a) Ga-PtNi/C and (b) PtNi/C during the voltage-cycling tests. The composition changes of Ni, Pt, and Ga atoms in the nanoparticles were determined by EDX (inset in the EDX mapping results)).